Two new (quickly made) videos to answer yesterday's questions and comments. There are lots of flute-care tips you can read or print out here. The second video is 6 minutes. I'm showing the markings that I use to put the headjoint on quickly, and set it to approximately A=440. 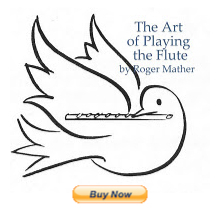 I don't care for 'sighting down the barrel' as some flutists do, to line up my headjoint. So the tiny tick-marks I use, put on with a special 'shiney surfaces' marking pen (buy at office supply) allows me to set my headjoint at the right angle to the body (this will be covered in a future video; how to determine the angle) and where A=440 is on my particular flute, at room temperature. Markings in all are drawn on my flute as explained in this video. I also show The Thumbport for the RIGHT thumb, pencil grips for the left index finger and other teacher's aids such as The Tuning CD. Do please feel free to leave your comments here, or on YouTube. Excellent - well done - very informative!!! Thank you Jen, your posts are always spot on and easy to understand. Thanks Meg. Great to hear from you! The markings for pitch is a good idea, although does it not make the flute less pleasing to look at? I'm not one of those flutists who's particular about keeping the flute "good to look at". I have added anything to my flute (key extensions, headjoint markings, grippy pads etc.) that helps me play better. c) the size of the performing space and projection required of the flutist. I find that the markings remain constant for the experienced player. As a beginner without the benefit of an instructor (for now), I am finding your videos and website incredibly helpful--THANK YOU! I will be checking back often to see if you have added more to your blog/website. Thanks so much for letting me know that you're a beginner, and that this stuff is of help! That's great news! Also, if you want to be instantly notified when there's new stuff up on my blog, just click on the "JOIN" button on the right. It's an automatic "feed" service that simply sends you an email if I put up anything new (videos, articles etc.) on my blog. No commitment; just a reminder email. Oooops. It's not a "JOIN" button, it's a "SUBSCRIBE" button. But it works great. Try it out. Thanks for the tip--I subscribed right away. I am taking my time and reading through all the material on your website and reading all the articles and references you have listed--whew! Very comprehensive. Now if I can just get my hands on some of the recommended beginner books, I might be able to move a little farther along in my studies. I love your videos. Keep making more as they are very helpful! Thank you!